The new Cardiff City Stadium is the home of Cardiff City Football Club and Cardiff Blues Rugby Club for the 09/10 season onwards. It was officially opened on 22nd July 2009 by the First Minister Rhodri Morgan when Cardiff City 'Bluebirds' played host to Celtic in a pre-season friendly, which ended in a 0:0 draw. The imposing £56m stadium seats 27,000 and is situated on Leckwith Road, a stone's throw from Ninian Park and just a few miles from the Arms Park, the clubs' former homes. The Cardiff City Stadium will also be used as an alternative to the Millennium Stadium for hosting Wales International football matches. It is hoped that a sell-out Cardiff City Stadium will generate a far more intimidating atmosphere for visiting teams than a half-empty Millennium Stadium. The first International match was played at the stadium on the 14th November when Wales beat Scotland 3-0 in a friendly. Another semi-International fixture that took place at the stadium was Cardiff Blues v Australia, which ended in a 3-31 win for the Aussies. It was the first time that the Blues had faced an International team since their formation in 2003. Earlier this year the Cardiff City Stadium played host to its first ever music concert. The Stereophonics performed an open-air concert at the stadium on the 5th June. This followed a decision by Cardiff Council's planning committee to allow concerts to take place at the stadium within a specific time period each Summer. By Car: Exit the M4 at Junction 33 and follow the A4232 towards Cardiff. Exit the A4232 at the B4267 turnoff and follow signs for the Cardiff City Stadium. 500 match day car park spaces are available. By Bus: Buses run approximately every 12 minutes from Cardiff Central Bus Station. For further information visit the Cardiff Bus website. 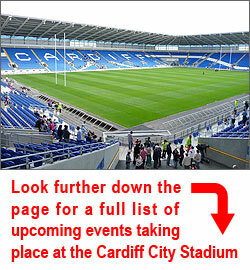 Also visit the Cardiff Blues website for information on free shuttle services for rugby fixtures. By Train: The closest train station is Ninian Park, 500 metres from the stadium. Cardiff Central Train Station is located approximately 2 miles away. For train timetables visit the Arriva Trains website and also the Great Western Railway (GWR) website. The stadium itself houses a number of bars, food outlets and a shop selling official club merchandise. A matchday pie will cost you £2.50 and a pint (of lager, bitter or cider) will cost you £3. You can save yourself 50p by opting for the meal deal, which includes a pie and a pint for a £5. The stadium is also located adjacent to a retail park, which contains various shops, supermarkets and eateries, some of which offer extended match day opening hours.